Britain is a very popular tourist destination — from the beautiful beaches in Cornwall, England, to the majestic Edinburgh Castle in Edinburgh, Scotland. But most tourists don’t realise that there are many hidden gems scattered around the UK, including caverns, ghostly pubs, secret gardens and ancient mazes. And if you prefer hill walking or discovering ancient forests, then there are many of those destinations that are not on your typical tourist map. Even people that live in Britain may not know about some of the well-kept secrets that the locals prefer to keep to themselves. There are many villages dotted about the countryside, and even in these times of modern technology, there are a number of people who still practice ancient customs. Whether it be Pagan festivals or local dialects, farming or secret rituals, you can still found these ancient ways being practiced throughout the UK. For centuries, many of the hidden, secret places have stayed that way. Mainly for two reasons. One being the fact that the locals didn’t want the secret to become a tourist trap. And the second being that the secret belongs to their local folklore, and they guard it fervently. I want to walk you through some of these locations, including the following. Lud’s church. Tourists might explore the surrounding area while on vacation, but many will pass by the entrance to this ancient chasm without noticing it. The Shell Grotto. This is another interesting and mysterious find. When visiting Margate, on the East Coast of England, most families head straight for the coast where there is lots of things to see and do. But by going off the main track, they will find this treasure. Exbury Gardens. Along with Exbury Gardens and the beautiful Eilean Donan Castle, it makes sense to plan your vacation with time for a diversion from the most popular and well known sites. 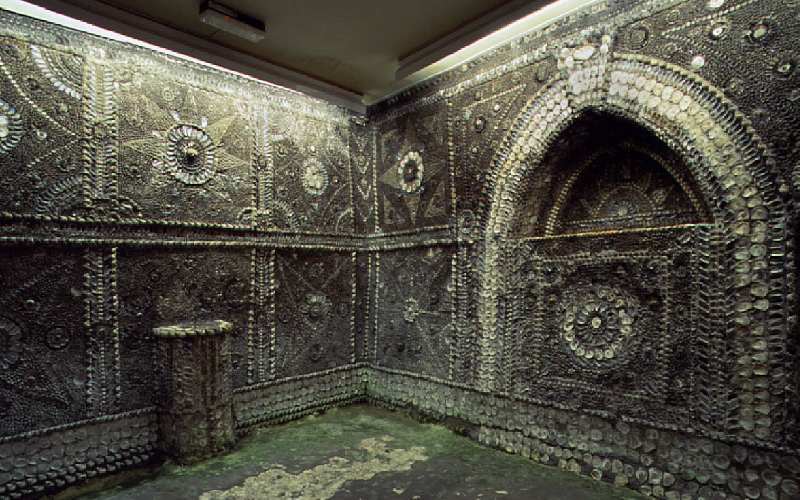 The beautiful Shell Grotto in Margate, England was discovered in 1835 by James Newlove. He lowered his young son Joshua into a hole while he was digging out a duck pond. The hole was deeper than they thought, and the boy scrambled down — only to discover a series of tunnels covered in shells. On investigation, they found that the tunnels were about 21 metres (70 feet) in length, ending in an oblong chamber. The walls were decorated with strange symbols and mosaic-ed in millions of shells. To this day, no one knows whether it was used as an ancient Pagan temple or a secret cult. Some believe it to be either thousands of years old, and others just a few hundred. The trouble being that the scientists cannot carbon date the shells because gas lamps were used to light the passage a hundred years ago. They produced too much soot, damaging the shells and making it impossible to accurately test the shells. But scientists tend to believe that it is very old. Their argument is that even though back in the 17th and 18th century, a lot of land owners made similar secret chambers. This grotto was found in a field that was nowhere near a large house or owned by a wealthy land owner. There is a small hole that aligns with the sun at the spring equinox in the roof of the grotto, and the walls are full of gods and goddesses portrayed within the shells. At visitbritain.org they point out that there is also an alter that seems to indicate that it was built at a much earlier age. With science reaching new boundaries, carbon dating or something similar will one day find out the age of the grotto. Until then, we can just stand in awe at the sight of the beautiful shells. I have visited it many times and still feel a sense of amazement at the work that was put into making it. Exbury Gardens were the idea of Lionel Nathan de Rothschild, and thanks to him, we have one of the most spectacular gardens in the UK. This is a garden for the young and old. With its masses of amazing colours and exotic plants, it was once described by a visitor as “Heaven with the gates open.” Rothschild loved all plants and was a keen collector. Little did he realise that his love of plants would make such a spectacular visitor’s delight. Along with an abundance of colorful plants, it also has the hydrangea walk, the sundial walk, and the rock garden. There is also a lovely steam railway that will take you around the gardens while sitting in comfort. This is a wonderful day out; there are many exhibitions and things for children to do. I chose this garden because it has been described as one of the most beautiful in the whole of Britain, and after taking a look at the photos of the wonderful flowers and view, I have to agree. So whether you prefer walking, going by steam train or even taking a chauffeur-driven buggy, I think you will love this little gem situated in Hampshire, England. An hour and half drive from London, and just a short ten mile ride from Southampton, you might consider getting to the Gardens by way of a chauffeur service hire. Chauffeurs are common in England, and as a tourist there’s no better way to get a feel of the old style and class of the British. Cars Exec is one such service that offers rides to just about anywhere throughout the United Kingdom. Throughout history, many people have escaped persecution by running away and hiding there. Robin Hood, Bonnie Prince Charlie and Friar Tuck are all reputed to have stayed there. It’s very possible that Bonnie Prince Charlie could well have taken refuge here, as well as many other famous people in history. But probably not Robin Hood. As we all know, he is just a legend. Or is he? Lud’s Church has a haunting aura about it. Walking down the path, it would be easy to believe that you had stepped back millions of years. Being part of the Peak District, there are many tourists, but strangely enough, not many actually know how to find Lud’s Church. Following directions to get there, it is still hard to actually see where the little path leads. After climbing a rather steep hill, the trail leads to the left. After pushing through the undergrowth, you suddenly step into the open and see the magnificence of the place. The height of the rocks and the narrow width of the setting produces a feeling of awe. It is like an open air church. The grey rocks underfoot are covered in a green algae, making it an amazing sight. The Greene Chapel in the famous poem Sir Gawain and the Green Knight was inspired by the glow caused by the algae. It makes a great story for the locals to boast about, and the legend lends itself to the mystery and beauty of Lud’s Church.